336: "He Who Inherits the Light"
Section 8: King's Memories arc (第（だい）八章（しょう） 王（おう）の記（き）憶（おく）編（へん） Daihasshō Ō no Kioku-hen) is a story arc in the Yu-Gi-Oh! manga. In the absence of furigana on 王（おう）, it has also been read as Pharaoh's Memories arc (王（ファラオ）の記（き）憶（おく）編（へん） Farao no Kioku-hen). 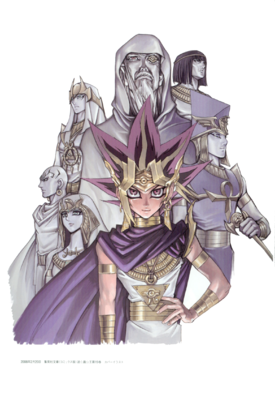 Dark Yugi replays his life as Pharaoh Atem, through the Shadow RPG. His friends from the modern world participate in the RPG as non-player characters. Ō no Na wo Sagashi!! "Attack the Shrine at Night"
Ten no Ikazuchi Bāsasu Ten no Yami!! "Heavenly Thunder vs. Heavenly Darkness!!" "The Power to Pierce the Darkness!!" "The Birth of the Millennium Items!!" "Awakening of the White Dragon!!" "The Vessel of the White Dragon"
"The "Pieces" of the World of Memories!!" Kyūkyoku!! Dāku Rōru Pureingu Gēmu!! "The Ultimate!! Dark Role-Playing Game!!" Maboroshi no Non Pureiyā Kyarakutā!! "Battle in the Holy Tomb!!" "Until Our Ba Runs Out!!" "The Shining Light of the Soul!!" "The Stone Slabs of the Modern World!!!" Ō no Na no Moto ni!! "In the Name of the King!!"